Are you looking for that perfect gift basket to send a special someone in Mississauga? No worries! Nutcracker Sweet carries the perfect gift baskets and we have been servicing the Mississauga area for over 30 years. Nutcracker Sweet Gift Baskets has next day gift basket delivery to Mississauga spanning 30 years. Our Flagship store is only 20 minutes away from Mississauga city center. We have specialized couriers delivering great corporate and personal gifts to Mississauga and surrounding areas. With Mississauga being home to over 50 Fortune 500 Canadian Head offices, Nutcracker Sweet is delivering daily to small and large businesses. Our trained and expert sales people work closely with many of these prominent businesses in the community to provide business solutions that make gift giving an easy, creative and fun process. Call today and we can set up a face to face meeting to discuss great gift basket options. To view a selection of our Mississauga gift baskets please click here. 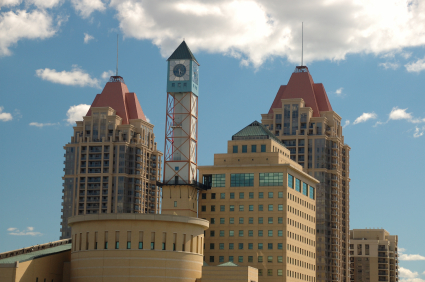 Mississauga is located in the Peel region which occupies the southern area of Ontario. However, Mississauga is still located in the western region of the Greater Toronto Area. In recent years, Mississauga has been developing rapidly. Many commercial businesses have migrated their headquarters to the city of Mississauga from their former Toronto locations. In the recent years, the city has been notable for their new architectural wonders. There are two 50-storey towers overseeing the skylines of Mississauga and are built with a unique curve. Because of their infamous curves, the condominiums are called the “Marilyn Monroe Condos”. They have become the iconic structures in Mississauga! Mississauga is also known for their large shopping center, Square One. It is located right across the Marilyn Monroe Condos. With over 360 stores and services, Square One is the largest shopping mall in Ontario and one of the largest in all of Canada. It has attracted a number of tourists because of their convenient location. The Toronto Pearson International Airport is located in Mississauga while Square One is a short drive away from the airport. Thus, tourists have chosen to reside in the City of Mississauga during their stay in Ontario. Everyone is always looking to give gift baskets to the wonderful people residing in Mississauga. From corporate clients to personal family gifts, Nutcracker Sweet has been the experts in Mississauga gift basket giving. From creating the stunning gifts to the wonderful drivers delivering them, we ensure every aspect of your gift will only leave your recipient content! Within all of Ontario, we are able to add in a bottle of wine to spice up your gift baskets! So, choose Nutcracker Sweet to send your perfect gifts to the clients, family, friends and everyone else in Mississauga.